This issue of The Letter concentrates on Lacan’s L’Etourdit from 1972, published in Scilicet in 1973. While Charles Melman had originally advised against its publication and Christian Fierens has asked ‘is it readable?’, one of our cartels has worked on it for a year and found it to be one of the later Lacan’s great écrits. This cartel was joined by another Ŕ and by Christian Fierens from Brussels Ŕ for a study-day on this enigmatic text in May 2009. This issue contains the papers and exchanges from that day. L’Etourdit itself has been painstakingly translated by Cormac Gallagher and it is published here in English for the first time. This will be an invaluable resource for other cartels whose members are courageous enough to follow Lacan’s ‘saying’ in it. The following is an extract from Christian Fierens‟ 2002 book, Lecture de L‟Etourdit. Lacan 1972 (Paris: L‟Harmattan, 2002), translated here into English by Cormac Gallagher. As a writer Lacan‟s whole life could be summarised by the wish “in the end to be properly read” (Lituraterre, Autres écrits, p. 13). Far from being material for a simple reading, the Ecrits of 1966 and a fortiori the Autres ecrits, published in 2001, should be deciphered as rebuses. In that, they fall into step with what is reserved for the dream in the Freudian Traumdeutung…..
(5, 449) In contributing to the 50th anniversary of L‟hôpital Henri-Rousselle for the favour that my friends and I have received there in a work concerning which I will indicate what it has been able to do, namely go beyond presentation, I pay homage to Dr. Daumézon who allowed me to do it. What follows, as is my custom, does not prejudge anything about the interest that was taken in it by those to whom it was addressed: my saying (mon dire) at Sainte-Anne was a vacuole just like at Henri-Rousselle, and, just imagine, for almost the same time, preserving in any case the price of this letter that I say always arrives where it ought….. This article suggests that in L‟Etourdit, the neologism “Vas” has a resonance for Lacan which returns us to the vase of the optical schema. By means of a drawing, an attempt is made to drape this vase with the logical accoutrements of the phallic function and the four formulae. As an example of “ab-sens”, working with “Vas” allows us take seriously Lacan‟s urging to locate the sphere of action of the analytic discourse. 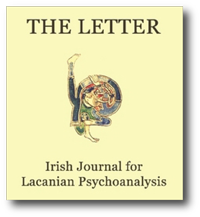 This paper expands on my presentation at the study day of one of the cartels of The Irish School for Lacanian Psychoanalysis, ISLP. Held on May 9th 2009, the study day came of our attempt in the preceding academic session to traverse – not read, not make sense of, literally traverse in the sense of traversing very difficult terrain Ŕ the first half of Lacan‟s L‟Etourdit……. One of the levels of complexity which is found in L‟Etourdit arises because Lacan distinguishes between “what is said”, “what is heard”, and “saying”. It is necessary to be aware of the differentiation he makes and the implication this has for signification. This paper shows how these issues affect interpretation within the clinic of psychoanalysis which relies on the movement of the four discourses. L‟Etourdit makes important distinctions between saying, what is said, signification, and meaning. I hope to show how they differ from each other, as this is essential when trying to understand some of the complexities of this challenging text of Lacan. I am relying of the interpretation by Christian Fierens which is found in his excellent book Lecture de L‟Etourdit,1….. This article examines Lacan‟s interpreting Schreber in terms of the “not all” of the formulae of sexuation. It demonstrates how a substitution of the exception and the masculine universal for the missing Name-of-the-Father and phallic signifier in “Schema I” sheds light on Schreber‟s “push-to-the-woman” and absence of phallic sense, but it also argues that Lacan did not equate the questioning of the exception in femininity with its foreclosure in psychosis. Having spent a year speaking about Schreber in his third seminar (1955-1956) and developed his thinking there in “D‟une question préliminaire” (1958), Lacan returns to Schreber in his enigmatic 1973 text, L‟Etourdit.1 He had already been speaking about there being “no sexual relationship” (“il n‟y a pas de rapport sexuel”) in “D‟un discours qui ne serait pas du semblant” (1971),…..
Christian Fierens argues in this paper against understanding Lacan‟s exception as a transcendental reality and, preferring L‟Etourdit‟s topological approach to Lacan‟s geometric one in 1958, he contends that Schreber was right to foreclose the exception since “Schema I” is the truth of “Schema R”. The following paper, translated into English by Cormac Gallagher, was read by Charles Melman during a two-day conference in 2003 on the themes of Christian Fierens‟ book Lecture de L‟Etourdit. Lacan 1972, Paris: L‟Harmattan, 2002. I got to know Fierens‟ book through Jean-Pierre Lebrun who sent it to me and I immediately found that it was an amazing work and that even if I was not necessarily in agreement with the reading that he gave of this text, it was one of the most stimulating and successful works to be met in our domain. I am saying this all the more because I have with this text of L‟Etourdit Ŕ I told Christian Fierens about it yesterday Ŕ a rather particular relationship. Because, I will pass over this very quickly, Lacan had given me this text for me to publish in Scilicet 4. I had given it back to him telling him that it was an absolutely unreadable, impossible text; that no one would ever understand anything in it; and that the sense of such a publication seemed to me to be absolutely not obvious. Which he did not take very well…..